Your body needs two important hormones functioning properly if you hope to lose that excess weight you might be carrying around. These two important weight loss hormones are insulin and leptin. Insulin’s job is to control sugar and fat levels in the body, while leptin’s job is to burn fat. Leptin is one of the many hormones that regulate energy in your body…it also tells you when you’re full. As you gain more weight, you produce more leptin which is supposed to tell you to when to “stop eating”. If these two hormones are out of whack and not functioning properly not only will you struggle to take weight off, you will surprisingly start packing it on even if you are dieting. Both these hormones are produced because of sugar. Eating too much sugar leads to fat gain that guess what, leads to more leptin circulating in your body. It only makes sense then that obese people contain high levels of leptin. “Weight loss resistance” is a condition that is results from “leptin resistance”, your body’s inability to use the leptin it produces. 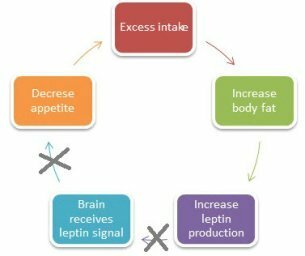 So, what causes leptin resistance? Sugar, plain and simple is the biggest culprit. Your body is only able to use a few tablespoons of sugar at a time any excess must be gotten rid of by your body; it must get into your cells in order to be removed from your blood stream. However, sugar in its present form cannot be stored by your body…the minute it comes in contact with the cell it is converted into fat. As you continue to gain weight and add more fat cells to your body, you produce more and more leptin and eventually your cells become resistant to its signal. Cut out sugar whenever possible…whenever it is not absolutely needed. Anything on a label that ends with “ose” is suspect such as sucrose and fructose…two you see often. It is a fact that sugar makes people fat. Adequate Sleep… without enough sleep your metabolism gets all out of whack and this causes a multitude of problems beyond your leptin issues. Eliminate Stress and Anxiety…they are killers in every area of your life. Change your lifestyle to eliminate as much of this emotional roller coaster ride as possible. Exercise…now you just knew this was going to be on the list. Use resistance weights first to turn on the metabolism. Once you feel back on track with your metabolism add cardio to your regular work-outs. Eat Protein…add some protein to every meal to slow the release of glucose. You must stabilize your blood sugar in order to rid yourself of the insulin/leptin cycle. Curb the carbs…You might as well just look at these processed foods as sugar because that’s exactly how your body treats them. They turn to glucose when your saliva mixes with them. The fastest and surest way to improve your leptin resistance is by making dietary changes that improve leptin function. Focus on meat, eggs, fresh fruits and vegetables and beans and leave out the highly processed carbohydrates as well as any other processed foods.